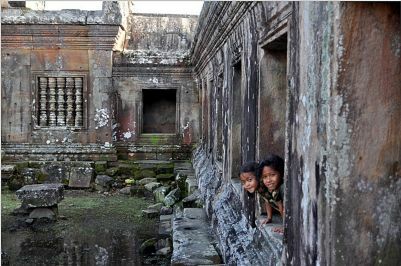 I have yet to meet a person who is not fascinated with Cambodia. Even if the person has no desire to visit the country, they never stop asking about the people, the culture, the safety, or the temples. It’s difficult to describe Cambodia because of its past ancient civilizations, a relatively recent genocide, and the ever-present reality of the growing economic gap, but I say two things: awe-inspiring and majestic. A couple of years ago, some friends and I rented a driver to take us from Phnom Penh to Siem Reap in his Toyota Camry so that we could see Angkor Wat. When we arrived, we hired a tuk-tuk driver to bring us to the world-renowned temples. I remember being really excited, but I was not prepared for what I saw: a vast, expansive sea of tourists. I was so distracted by the people that I forgot to appreciate what I was actually looking at. When I read the NYT’s piece about Preah Vihear Temple, located in the north-east of Cambodia, I thought it sounded inspiring and majestic. The temple was built between the 9th and 12th Centuries and it receives, on average, a paltry five tourists a day — mostly Buddhist monks on pilgrimage. It’s longingly described as being “breathtaking” and “spectacularly situated” atop a plateau. However, be forewarned: This sanctuary may not be ready for mainstream tourism. The temple borders with Thailand and the fight for ownership of the land has erupted in military combat. Despite the “apparent tranquility,” the sense of uneasiness is palpable. Thai and Cambodian military bunkers lie just 20 yards apart in a clearing in the forest outside the temple. Even though some are slumbering or talking on their cell phones, they are apparently ready to fight at any given order. Nevertheless, the site is described as an “Anglorian masterpiece” and every bit worth the heart-lurching effects. Is it the treacherous voyage of getting there, or the touch of something divine? Either way, as the author points out, be prepared to be richly rewarded. You can visit the temple’s site to keep updated about the conflict or check out the end of the article for tips on how to safely get there.